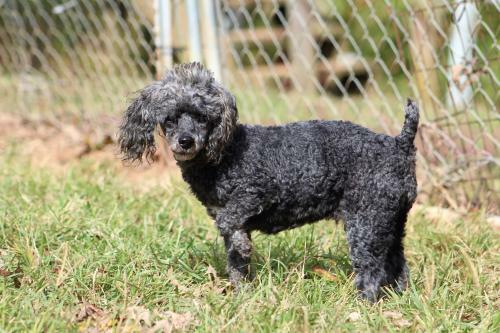 Reason for being in rescue: Teddy was lovingly surrendered to Carolina Poodle Rescue by owners who could no longer care for him. Special Needs: Teddy had cataract surgery in February 2019. The surgery was minimally successful in restoring his vision. Teddy is completely blind in his left eye, but does have some vision in his right eye. He is also on a daily blood pressure medicine to help maintain low pressure in his eyes post-surgery. The cost of this medicine is $16 per month. What kind of home would be best for me: Teddy is looking for a home where he can be the only dog. Too much activity is challenging for a boy with limited vision. Teddy would love a retired family with a lap he can sit in all day. What is my personality like: Teddy is a great boy who wants a quiet life. Though he has limited vision, he is incredibly handi-capable. Teddy's favorite thing is a lap to sit in. He wants to be near his people and wants to be touched. He sleeps happily in the bed at night pressed closely against you. Teddy is living in a foster home with other dogs, but would really prefer to be the only dog. Other animals are competition for attention and can startle him due to his vision. Teddy's ideal home is with a retired family who is looking for a loving lap pet!